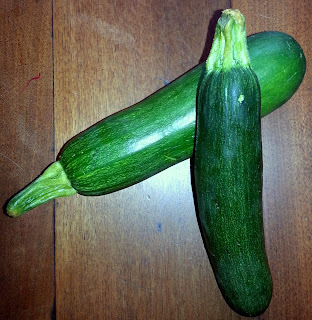 Summertime means lots of fresh zucchini. I like to cut an unpeeled zucchini in half, brush lightly with Olive Oil, add salt, pepper, fresh chopped oregano. Grill on medium heat turning at an angle to make cross hatch grill pattern. When the zucchini's are just barely tender, turn flesh side up and top with Parmesan Cheese. Keep on the grill just long enough for the cheese to melt. 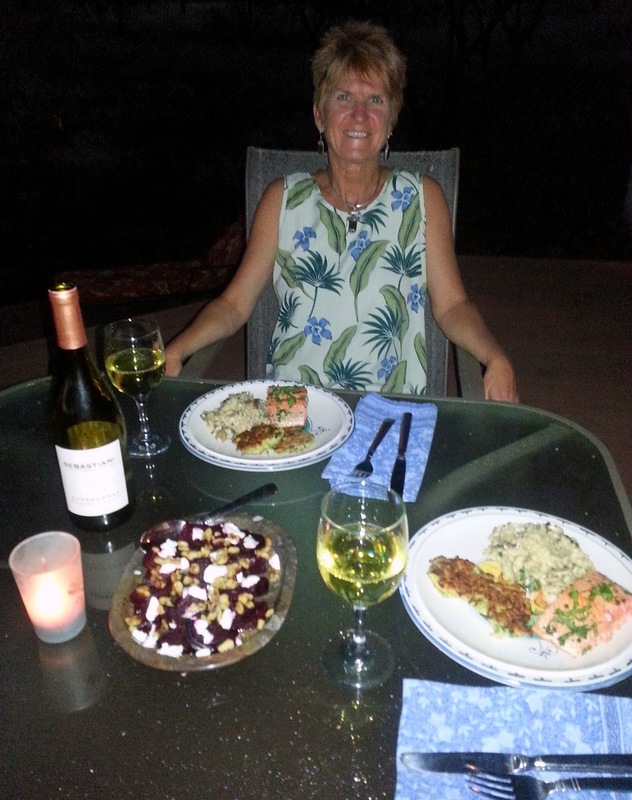 The other evening I had my friend Paula over for an al fresco dinner. She is a fabulous cook herself and we had a blast cooking together. 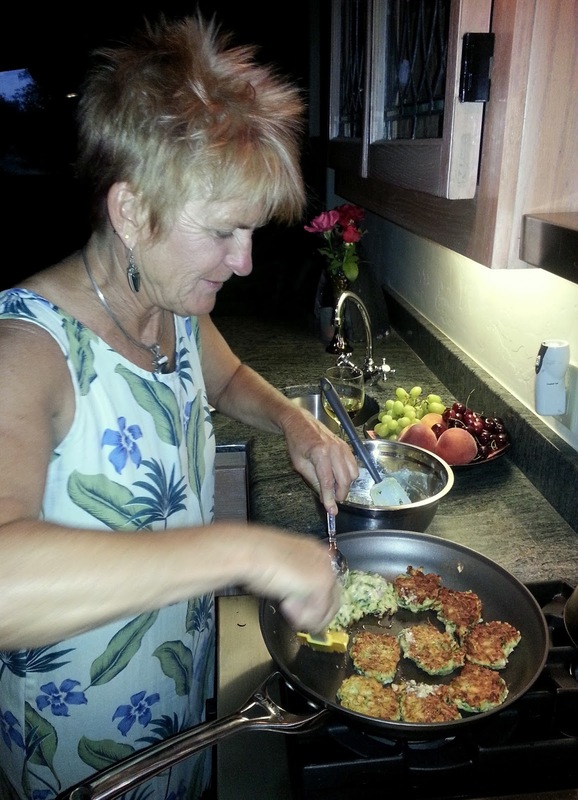 Paula mixed up the fritter batter and fried the zucchini. Grate zucchini and place in a colander. Toss with 1/2 tsp. salt and let sit for 30 minutes to drain. Squeeze dry. Mix 2 eggs with all other ingredients. Stir in zucchini. Heat a pan and drop by heaping tablespoons frying until golden brown on each side; about 2-3 minutes per side. I think these would also be excellent with Italian herbs and parmesan cheese. I served the fritters with pan seared Wild Sockeye Salmon marinated in basil oil. Technically when you make an herb oil you blend whatever herb you are using with olive oil and then heat for about 1 minute. Strain through fine mesh strainer and strain again through cheesecloth. This gives you a clear flavored oil. I just blended 2 large handfuls of fresh basil with about a cup of olive oil and left the "fruit" in. I think that lends a greater depth of flavor and don't mind the little bits of basil. Slather both sides of the salmon filets with about 1 Tbsp. 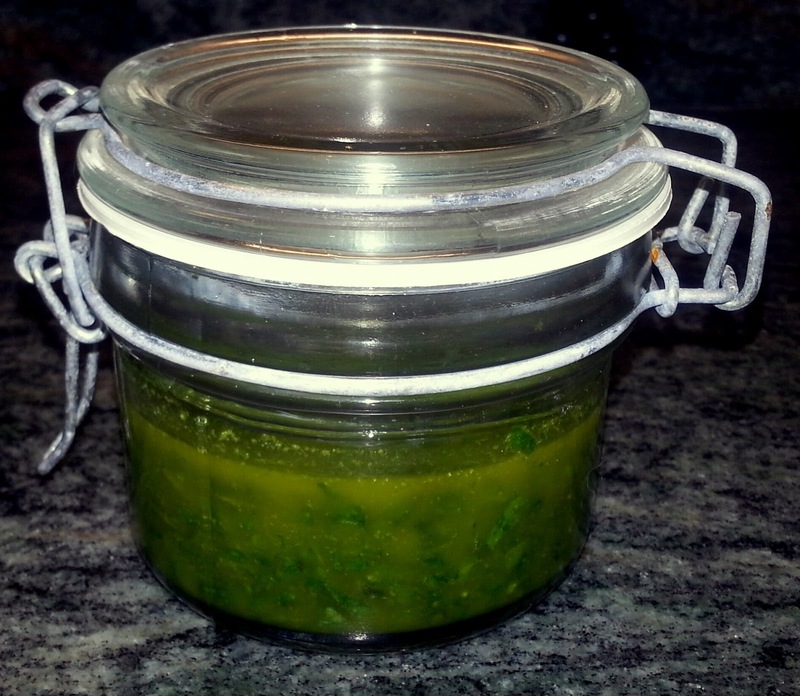 of basil oil per side. Liberally add salt/pepper. Let sit on the counter for about 1/2 hour to marinate. Add 1 Tbsp. each of olive oil and butter to a frying pan. Get your pan smoking hot and lay the salmon in, skin side down. Do not turn down the heat as you want the skin to get very crispy. It makes a bit of a mess, but is worth it. 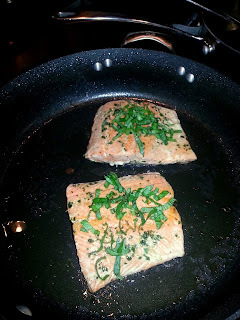 Depending on the thickness of your filet you may not even have to turn the salmon if you can see that it has become opaque and is cooked through. Add chopped fresh basil to the top. We also had a lovely roasted beet salad with our meal. To roast the beets: Preheat oven to 400 degrees. Wash beets thoroughly and cut off tops and bottoms. You do not have to peel. If the beets are very large, cut in half. Line a baking sheet with foil and drizzle on olive oil. Rub all sides of the beets in the olive oil and then add salt. Roast until tender; about 45 minutes depending on size of beet. 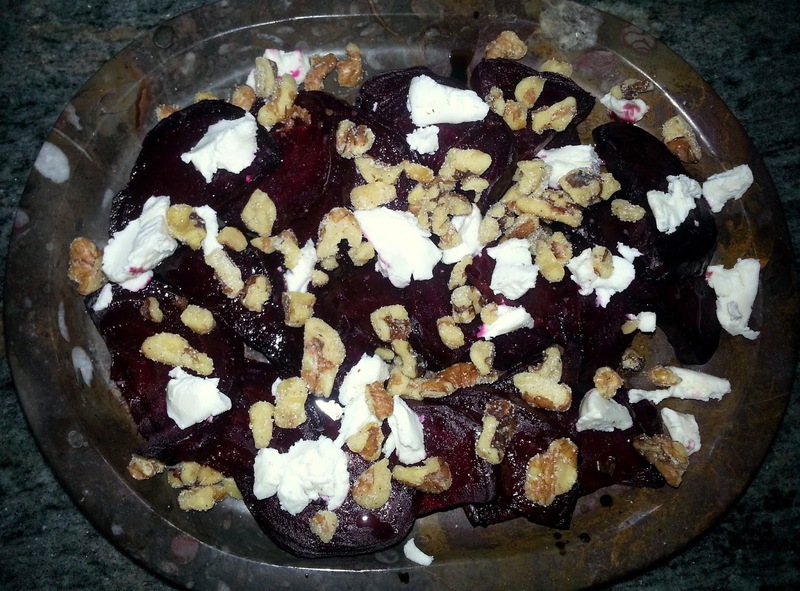 This can be done in the morning or even the day before, but bring beets to room temperature before proceeding. Once beets are cooled, with a sharp pairing knife remove the skin. It should come off easily. Heat a small frying pan and add 1/2 cup chopped walnuts. Mix in 1/2 tsp. salt and 1/2 tsp. sugar. Swirl the pan until the sugar just starts to melt. Remove from heat. To assemble salad: Slice the beets. Add the toasted walnuts and feta cheese. Drizzle with a bit of Olive Oil and a nice Balsamic vinegar. You can put this salad together before your guests arrive and just leave on the kitchen counter. 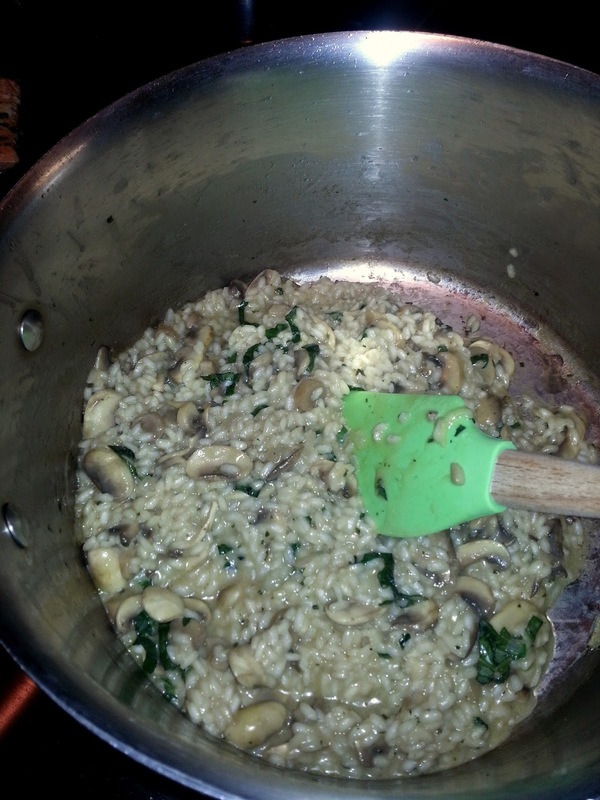 A mushroom basil risotto accompanied our meal. See: http://cookwithcindy.blogspot.com/2012/03/risotto-time.html for recipe. This time I added a big teaspoon of the basil oil, lots of sautéed mushroom and garlic and more fresh chopped basil. 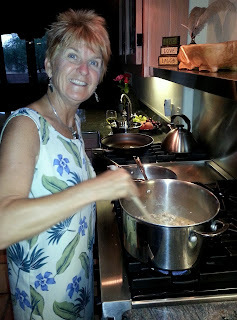 And here is Paula stirring the risotto. You may be wondering if I cooked any part of this meal? We did the whole thing together which is always such a treat! Heat chicken stock until bubbly and keep it hot as you add the liquid to the rice. Stir. Stir. Stir. This releases the starch from the rice making it creamy and forming its own sauce. Add 1/2 cup hot chicken stock at a time and keep stirring until that stock has absorbed before adding more hot stock. I love to eat outdoors on warm summer evenings. I think it makes meals even more special! 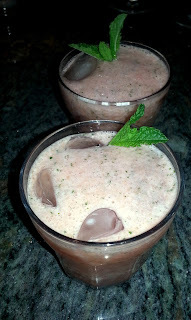 We concluded our feast with a refreshing dessert drink. Blend all and garnish with the mint. I LOVE TO COOK WITH OTHERS! THANK YOU PAULA! WHAT A FUN NIGHT! IN THIS CASE SWEET BREAD.